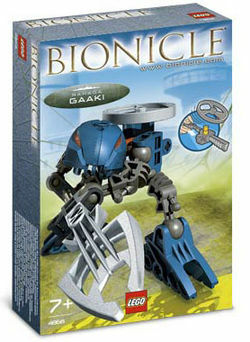 4868 Rahaga Gaaki is a BIONICLE set released in 2005. It included a silver Rhotuka Spinner, a Rhotuka Launcher, Gaaki herself, and her staff. She was one of the six Rahaga released. She was originally a Toa Hagah, but a set was never released of her in Toa Hagah form. This is a description taken from LEGO.com. Please do not modify it. (see an archive of the product's page) Underwater huntress! Add #4869 & #4870 to this set to build a Rahi Ice Vermin! Her head and weapon are the same as those of the Rahkshi Guurahk. Facts about "4868 Rahaga Gaaki"